Shamma Sandals has updated their lineup with the adventure-ready and waterproof Ultra Chargers! The highlight of the new model is its grippy and waterproof all-weather UltraGrip footbed! Looking for my own adventure, I put the new model to the test along the running trails and mountain hikes of Madeira Island! Read through to see my thoughts on the new Shamma Sandals Ultra Chargers! The Chargers have an updated Ultra Lacing system from Shamma Sandals. This system, as seen in previous versions Shamma maintains a secure fit, but with more comfort than many other sandal designs. Nearly every aspect of the fit can be adjusted to my needs. The center buckle can be moved in all four directions on top of your foot for the most comfortable fit, the main velcro strap can be adjusted forward and back, and the rear heel strap (my favorite aspect of the system) really locks in the sandal and rounds out the entire system. In addition, the velcro straps have been given little tabs to assist with tightening down and removing the straps. This was the first time I had seen a little tab like this and I hope that other sandals start taking note. It is a very polished system. No need to fiddle with self tying, cutting excess strapping material, or using a match to seal things up. I have had to do a little “sandal surgery” on some hikes when I encounter a paracord snap, or when narrow webbing rubs too much and I get a blister around the toe post; no such issues will occur with the Shamma Sandals lacing system. 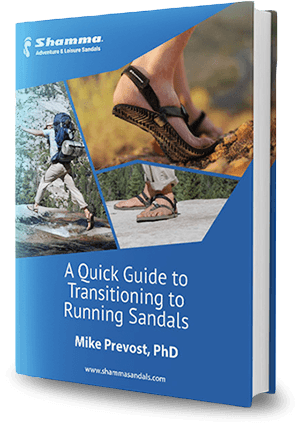 Most huaraches have a weakness in the rear heel strap and can cause some irritation over time, especially if they are too tight or too loose, but the webbing and suede combo really makes the entire sandal feel invisible. The webbing has been updated to be more comfortable right out of the box and important contact points are given extra comfort with suede liners. Even though the wide webbing is already very comfortable, the suede is a nice touch and makes the Charger the most comfortable sandal in my closet and the easiest to live with. Strap adjustments are incredibly quick and easy with the velcro straps and center buckle and everything is very secure; once I locked everything down, nothing is going to move even after an entire day of hiking. In a previous review, I used Shamma’s Power Straps to get a little extra security, but I left those at home and never regretted leaving them behind. The Power Straps are extra straps that add extra security around the top of the foot. However, the sandals are plenty secure on their own and do not require the Power Straps except in very specific conditions. Having reviewed Shamma Sandals in the past, I decided to just go for it only bring the Ultra Chargers to the trip with no alternative sandal, shoe, or option should I encounter tough terrain, poor weather, or a strap break. I went in with an open mind and was rewarded with a wonderful running and hiking experience that I will never forget. About the Author — I'm a lecturer in Statistics and American Government and photographer living in Boston. I hold a PhD in Political Science. I've been a minimalist and barefoot runner for the past five years and have flat dinosaur feet. I was recommended motion control shoes in high school and they were a miserable experience. I switched to minimalist shoes and I now smile with every run.